Numerous approaches to treatment of dry AMD are under development. Although these precautionary measures can help to decelerate AMD progression, often some form of therapy is ultimately required. 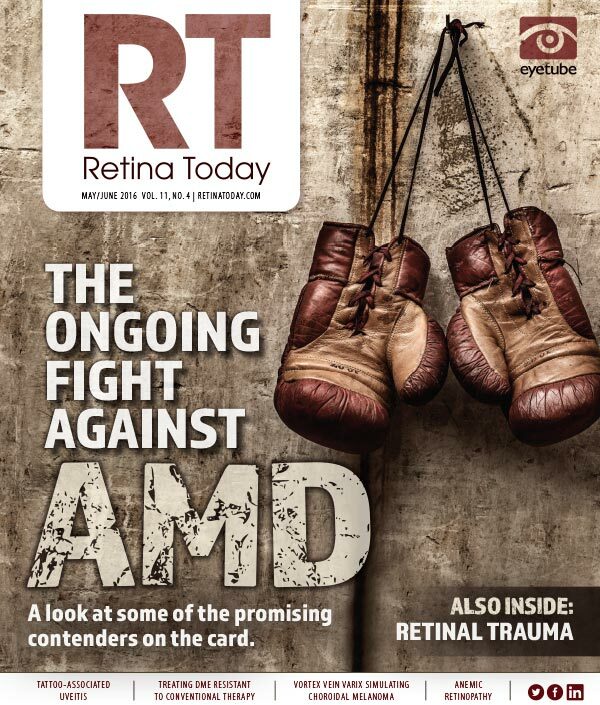 This article describes therapeutic options in development that could pave the way for more effective management of dry AMD. No treatment options for dry AMD are currently in the market, and patients are usually advised to follow the precautionary measures outlined above to help slow disease progression. Many companies and researchers are developing products to target dry AMD progression by exploiting a variety of modes of action. 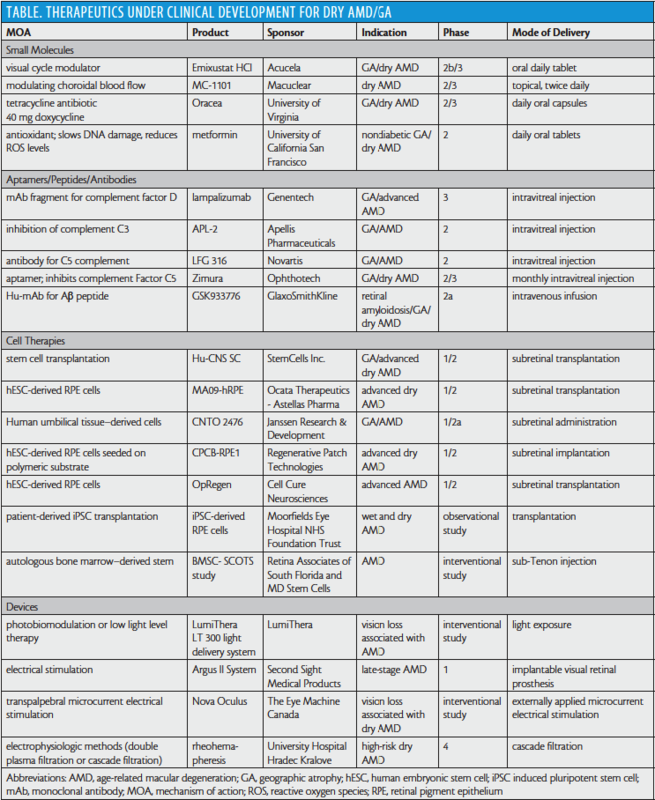 The table “Therapeutics Under Clinical Development for Dry AMD/GA” outlines small molecules, cell therapies, devices, and aptamers/peptides/antibodies in development for dry AMD treatment. Inhibition of the complement system has been studied as a therapeutic approach, as local inflammation and complement activation are implicated in drusen formation. 1. Age-Related Macular Degeneration (AMD), National Eye Institute, NIH. https://nei.nih.gov/eyedata/amd. Accessed March 28, 2016. 2. The Progression of Age-Related Macular Degeneration. AMD Blog. Dec 6, 2012. www.amdblog.org/macular-degeneration/wet-amd/the-progression-of-age-related-macular-degeneration/. Accessed March 28, 2016. 3. Mogk LG. What treatments are available for dry macular degeneration? Vision Aware. American Foundation for the Blind. www.visionaware.org/info/your-eye-condition/age-related-macular-degeneration-amd/treatments-for-dry-macular-degeneration/125. Accessed March 28, 2016. 4. A randomized, placebo-controlled, clinical trial of high-dose supplementation with vitamins C and E, beta carotene, and zinc for age-related macular degeneration and vision loss: AREDS report no. 8. Arch Ophthalmol. 2001;119(10):1417-1436. 5. Preidt R. High-dose statins may ease macular degeneration for some. MedlinePlus. February 4, 2016. www.nlm.nih.gov/medlineplus/news/fullstory_157084.html. Accessed April 11, 2016. 6. Boman N. Human visual cycle modulation for dry AMD. Retina Today. 2010;October:76-77. 7. Lampalizumab. Genentech: Our Pipeline. www.gene.com/medical-professionals/pipeline Accessed April 20, 2016. 8. Apellis: Pipeline. www.apellis.com/focus.html#pipeline Accessed April 20, 2016. 9. Ambati J, Atkinson J, Gelfand B: Immunology of age realted macular degeneration. Nat Rev Immunol 2013, 13:438-51. 10. Zimura Anti-C5 Clinical Development. Zimura. Ophthotech. www.ophthotech.com/product-candidates/arc1905/ Accessed April 20, 2016. 11. Alzforum. Therapeutics. www.alzforum.org/therapeutics/gsk933776. Accessed April 11, 2016. 12. MacuClear. Future Treatments. http://macuclear.com/technology/future-treatments/. Accessed April 11, 2016. 13. MacuClear. Technology. http://macuclear.com/technology/. Accessed April 11, 2016. 14. Clinical Study to Evaluate Treatment with Oracea for Geographic Atrophy (TOGA). ClinicalTrials. NIH. https://clinicaltrials.gov/ct2/show/NCT01782989. Accessed April 20, 2016. 15. Metformin for the Minimization of Geographic Atrophy in Patients with AMD (METforMIN). ClinicalTrials. NIH. https://clinicaltrials.gov/ct2/show/NCT02684578. Accessed April 20, 2016. 16. Study of HUCNS-SC Subretinal Transplantation in Subjects with GA of AMD (RADIENT). ClinicalTrials. NIH. https://clinicaltrials.gov/ct2/show/NCT02467634?term=NCT02467634&rank=1. Accessed April 20, 2016. 17. Safety and Tolerability of sub-retinal Transplantation of hESC Derived RPE (MA09-hRPE) Cells in Patients with Advanced Dry Age Related Macular Degeneration (Dry AMD). ClinicalTrials. NIH. https://clinicaltrials.gov/ct2/show/NCT01344993?term=NCT01344993&rank=1. Accessed April 20, 2016. 18. A Safety Study of CNTO 2476 in Patients with Age-related Macular Degeneration. ClinicalTrials. NIH. https://clinicaltrials.gov/ct2/show/NCT01226628?term=NCT01226628&rank=1. Accessed April 20, 2016. 19. Study of Subretinal Implantation of Human Embryonic Stem Cell-Derived RPE Cells in Advanced AMD. ClinicalTrials. NIH. https://clinicaltrials.gov/ct2/show/NCT02590692?term=NCT02590692&rank=1. Accessed April 20, 2016. 20. Safety and Efficacy Study of OpRegen for Treatment of Advanced Dry-form Age-Related Macular Degeneration. ClinicalTrials. NIH. https://clinicaltrials.gov/ct2/show/NCT02286089?term=NCT02286089&rank=1. Accessed April 20, 2016. 21. Production of iPSC Derived Cells for Transplantation in AMD. ClinicalTrials. NIH. https://clinicaltrials.gov/ct2/show/NCT02464956?term=NCT02464956&rank=1. Accessed April 20, 2016. 22. Stem Cell Ophthalmology Treatment Study (SCOTS). ClinicalTrials. NIH. https://clinicaltrials.gov/ct2/show/NCT01920867?term=NCT01920867&rank=1. Accessed April 20, 2016. 23. LumiThera. Photobiomodulation. Research. http://lumithera.com/research/. Accessed April 11, 2016. 24. Second Sight Announces First Age-Related Macular Degeneration Patient Receives the Argus II Retinal Prosthesis System as Part of Groundbreaking Study [press release]. Slyfar, CA: Second Sight Medical Products; July 22, 2015. 25. Enhanced Vision. Microcurrent stimulation study for dry AMD. www.enhancedvision.com/low-vision-info/microcurrent-stimulation-study-for-dry-amd.html Accessed May 16, 2016. 26. Schreiner T, Rink S, Brunner R, Borberg H. First experience with a ready-for-use rheohemapheresis system. Transfus Apher Sci. 2001;24(2):125-128. • vice president of retina at Ora, an ophthalmic clinical research and product development firm, in Andover, Mass.